We have added a new template to Faculty Domains, and it’s official name is SplotPoint. This is a fun and yet experimental template that allows you to “present from the web”. It also has a funny name. If you want to know what a SPLOT is, well, let Alan Levine’s SplotPoint presentation explain it. Perhaps, you need a more succinct explanation of what a SPLOT is. So what’s the advantage of SplotPoint? 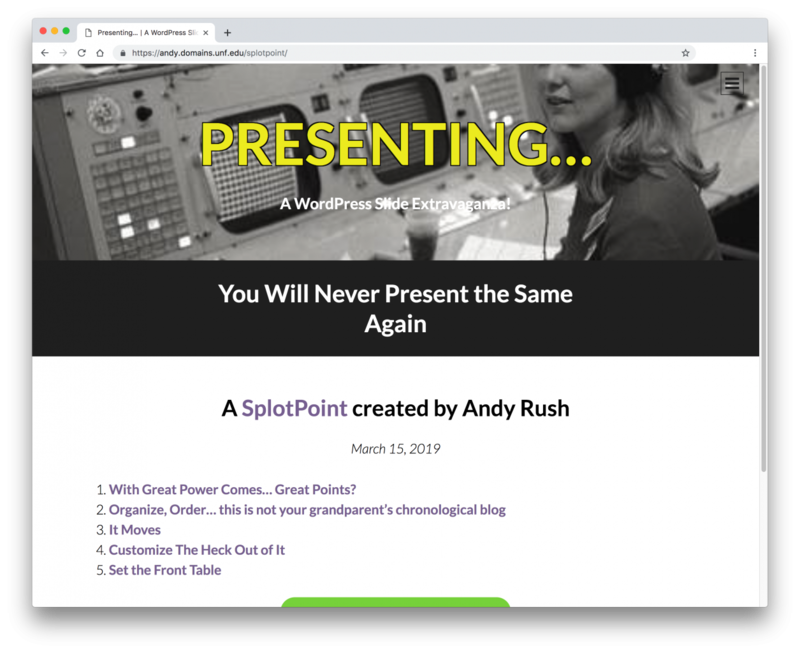 Unlike PowerPoint, Keynote, Google Slides, or whatever your preferred presentation software is, SplotPoints are born on the web using WordPress as the “application” to build them. Each slide has it’s own home on the web. You can give a presentation in a traditional way. Slides can be presented full screen, using a browser’s full screen mode (most of them have it). You can even advance your slides using the arrow keys on your keyboard. However, the best part is that the slide can have “notes” below the slide so as you present the information, you can refer people directly to the slide on the web where they can see all of the resources on a particular concept. Again, this idea is experimental, and you may have questions about this or that feature missing. The concept of SplotPoints is simplification of presentations. Ideas are introduced simply so the presenter doesn’t compete with fancy transitions or tons of bullet points. You know about Death By PowerPoint, right? Anyway, try it. When you install WordPress using UNF Faculty Domains, you need to select the Presentation Template (SplotPoint). The makers have posted instructions on how to use SplotPoint, and even on how to install it from scratch. If you have any questions, please contact us.